During my inaugural Symbiosis Gathering in 2013, in the dust of central California, I found myself neck deep in the promise of a new tomorrow after almost a week filled with the shiny allure and intoxicating illusions of West Coast festival culture. Dancing into the blackest of nights, we arrived at a veritable seance of sorts. Appropriately, we sat in lotus position, ensconced by the pristine chapel of sound that was the magnificent Pantheon Stage. Titanic, throbbing bass hurled at us in bottomless soundwaves unlike any I’d ever absorbed. Meditative drums rode bulbous bass lines and spirited chanting for a mystical dub, all of it seeming to levitate amidst emotionally charged mantras of empowerment. Didjeridoo and guttural throat-singing reverberated under the irresistibly danceable riddims. A charismatic bringer-of-life captained this unforgettable journey, one who resonated passionately with every beating heart in that vibrant vestry. What we experienced late that night was nothing short of transformative, and it came courtesy of the aptly-monikered, impossible to quantify, and ambitious Liberation Movement. No matter what scene or style or genre you seek, be it at a music festival or in your everyday listening pleasures, Liberation Movement are unlike just about any entity that’s making musical art today. A multi-generational, poly-cultural, international consortium of musicians, poets, activists, teachers, ritualists, and seekers, this entity forms like Voltron, and takes the stage as a jamming live band. Running the gamut from style to sound design, Liberation Movement is a unique hybrid of instrumentation and live electronic production; even still, they are an anomaly in the scene today. Within riveting, theatrical live performances rich in nuance and depth, are messages of oneness, the familiar ideas of freedom, knowledge of self, wisdom of the gods, understanding traditions, and cultivating connectivity. Liberation Movement itself is a living, breathing microcosm of festival culture, and all of us within it. Thanks to the group’s long-awaited, headlining performance on the Alive Stage next weekend at Lucidity: Rising Dawn, the festival is sending a strong, loud message to the people. Lucidity puts a premium on curating lineups and vibes that meld artistic integrity and intention with the universal healing power of music. Apropos of that, Liberation Movement will take the stage and artfully impart this crystallized message: The final liberation of all beings will happen in the now. A righteous assembly that honors the spirit of improvisation and ancient traditions, Liberation Movement is an amalgamation of powerful ingredients such as the human experience, cultures, lineages, instruments, ideas and vibrations. Songs like “The Power” and “End of Deception” brim with inspirational lyrics and exemplify the fierce, revolutionary undercurrent that permeates the project. Each individual brings his or her unique offering to the ceremony, all weaving together their own histories, cultures, songs and traditions – much like what we experience at festivals. “Liberation Movement is ultimately a gathering of gatekeeper archetypes, coming together to usher in a new form of liberation technology through music and vibration,” explains founder/bandleader Resurrector (government name Grant Chambers), formerly of pioneering collective Heavyweight Dub Champion. Liberation Movement counts upwards of seventy-five collaborators in its more than seven-year adventure of burrowing below the bassline into galaxies of sound design, improvisation, and human consciousness. The culmination of their spiritual, artistic, and personal energies takes place when the group manifests in the moment; they are, in essence, a jam band, one that never plays the same song or show twice. At the core of this project is a combination of autonomous energies, which yields maximum inspiration for instrumentation, subject matter, lyrics, and even silence. Maria Herrera has been a devotee since that fateful night at the Pantheon at Symbiosis Gathering in 2013. She offered her take on what separates the band from the festival norm. “Liberation Movement is not merely music, it is ritual. I find it very hard to articulate the feeling or describe the moment when I first experienced them live. [It was] almost like experiencing reality at a heightened level through songs intended to guide you inward. At a live show, this art is creating a space in which I am allowed to experience myself in ways I had not before, or in ways I'm not allowed to in my everyday life." This project is the brainchild of Chambers, a lionhearted missionary who has spent his career performing and honoring the history and pioneers of soundsystem culture. Chambers believes that the project is a collaboration between the core members, and with the audience, coalescing as one collective organism, and steadily evolving on a path to ultimate liberation. The band employs a massive array of organic instrumentation, electronic technology, sound design, and an ever-evolving cast of characters. The music they create onstage together simply defies genre or categorization; listeners will hear dub, bass, psychedelic hip-hop, kirtan, afrobeat, reggae, rhythm and blues, and so much more. The band’s invigorating anthems are at once native to the Playa, the jungle, and the beaches around the world. Liberation Movement transmits a universal language understood in the favelas, ghettos, projects, shantytowns, and neighborhoods dotting the globe. A close collaborator of Chambers since this vision quest’s embryonic stages is longtime foil Sasha Rose. Her electrifying vocals and impassioned live performances have informed the band's ethos and mystique as much as any other component. Rose is a revered solo artist, multi-instrumentalist and producer in her own right whose reputation precedes her among global Ecstatic Dance communities and the West Coast festival circuit. Rose shines on several chestnuts within the Liberation Movement catalog, including “Divinity,” her paeon that incorporates acoustic guitar. The trifecta at the helm of Liberation Movement is completed by a mesmeric frontman, the emcee, singer, poet, lyricist and lightning rod of kinetic energy, Noah King. Cut from the same righteous cloth as Zack de la Rocha and Robert Nesta Marley, King channels the revolutionary spirits of his influences, whilst injecting a healthy dose of reality into his rhymes. Onstage at Global Eclipse Gathering last summer, he was nothing short of a force of nature – renowned musician Gaudi even told us, "Liberation Movement was the highlight of Oregon Eclipse." When Rose and King are fully activated at the forefront of the Liberation Movement, there is nary a duo as dynamic. 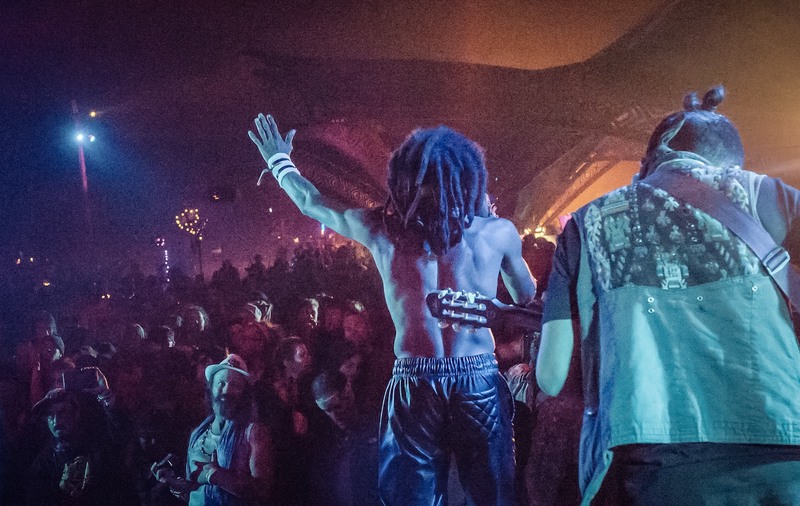 Liberation Movement will bring a 10-piece live band to Lucidity – its first complete collective alignment since those three phenomenal sets at Global Eclipse Gathering. In addition to the visions of Chambers, Rose and King, Liberation Movement members come from an array of potent lineages and all walks of life. The membership is a consortium of experts with wide-reaching influence, though they are not exactly strangers to the mainstream spotlight, either. Most notably, the breathtaking Soriah is a world-champion Tuvan Throat singer who has appeared on America’s Got Talent. His onstage presence and jaw-dropping vocals must be felt to be believed. King is the son of Commodores founder William "WAK” King, and was the winner of Instagram’s 4 Bar Friday, a weekly rap contest on the social media app. King also moonlights as lead singer of Los Angeles-based band Tyrone’s Jacket. Liberation Movement's main engineer Oz Fritz has been behind the boards for Grammy-winning albums and worked with the likes of Miles Davis, Tom Waits, and The Ramones. James Small is their regular drummer, but he holds down the kit for Grammy-winning blues phenom Fantastic Negrito when Liberation Movement isn’t dazzling festival audiences. Lux Moderna (“Black Sun”) is a successful electronic artist, having appeared at Burning Man, and festivals such as Sonic Bloom, Lightning in a Bottle, and Symbiosis Gathering. She is a featured artist in the recently released film Amplify Her, a documentary that follows several female electronic producers as they navigate the patriarchal waters of the music industry. Multi-instrumentalist Vir McCoy (Hamsa Lila) has made a name for himself around the world through a variety of projects; most recently his group Dogon Lights released their sophomore LP Ride It on Jumpsuit Records. Hawaii’s Olivia Ruff is the lead singer of kaleidoscopic Bay Area-based five-piece Mama’s Soup. Reggae vocalist Wailer B (Roots Revolt) is yet another accomplished contributor to Liberation Movement. The St. Thomas-based artist has a storied history of recording and performing alongside Resurrector in Heavyweight Dub Champion, a musical partnership that dates back over fifteen years. In addition to being the resident guitarist and vocalist of Liberation Movement, when speaking of authentic revolutionaries, El Suchi (Daniel Garcia) is the real deal. Though outside the spectrum of musical performance, El Suchi has experienced thrilling success of another kind, the sort of renown at the core of what Liberation Movement is about. With his revolutionary video and song “Renuncia Ya,” El Suchi helped usher the groundswell of activism and subsequent resignation of Guatemalan President Otto Perez Molina in late 2015. The song was emblematic of the struggle and resulting victory; it was shown around the world on various major media outlets, including CNN International. Liberation Movement declares themselves determined to bring greater appreciation for process, in general. They want to help redefine the way our culture relates to age and wisdom. Since the project’s inception in 2011, Liberation Movement has intentionally united with wisdom keepers from ancient cultures around the world, in order to better understand and assimilate that wisdom in their musical presentations. In fact, the group has recorded more than 25 Shipibo shamans from Amazonian Peru. In 2014 they received a financial grant from the Rubin Foundation, a non-profit that promotes art for social justice, in collaboration with the Peruvian NGO Alianza Arkana, to hold a concert in Pucallpa, Peru. There, the ensemble performed with two indigenous shamanic singers, playing to about 600 indigenous Peruvians. The collective’s journey through Peru is a major component of a longform documentary in the works. Beyond the forthcoming live performance and subsequent film, Liberation Movement is working toward the long-awaited release of their most ambitious undertaking, a tetralogy entitled The Gate. Chambers lights up when he speaks of the nearly fifty different contributors to this behemoth slab of recordings. The series begins with The Gathering, a communion of the Gatekeepers and Sovereign Souls, for the manifestation of the Liberation Movement. Volume Two is the Purification Chamber, featuring Icaros from the Peruvian Amazon. Volume Three is The Source, a live, unplugged and raw elixir. Volume Four is The Otium, which puts the focus on the creation of a new reality, improvised and instrumental in full symphonic expression. Regardless of whether or not you prefer a vibrant live band or progressive electronic music, Liberation Movement’s offerings have enough flavor to satiate even the most jaded festival-goer. 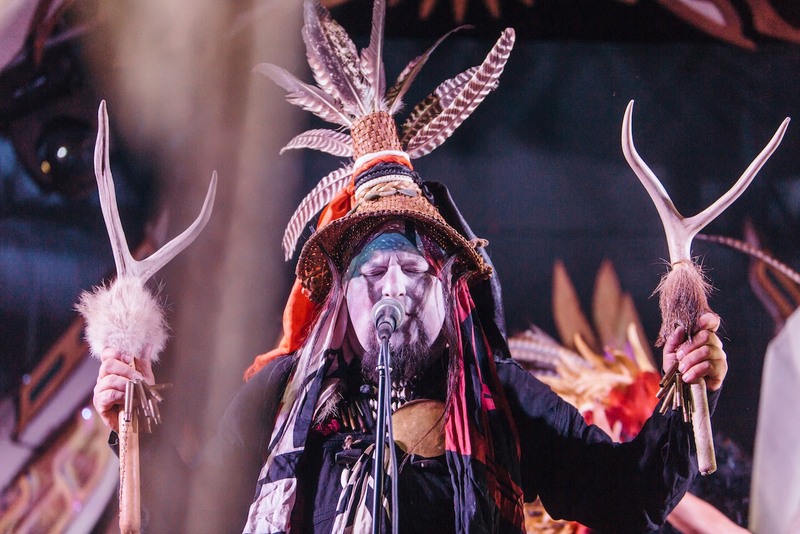 Their performances are nothing if not extraordinary, a fantastic voyage thirty thousand leagues deep into realms of spirituality, tradition, and improvisational art. If given the rare and treasured opportunity to experience such a majestic musical offering live in concert, do not let it pass you by.